Hi-Line Plus ceiling fans can be used in offices, stores, shops, foyers, schools, hospitals, kitchens, restaurants and many industrial applications such as warehouses, factories, tanneries, and workshops. Hi-Line Plus fans will provide effective and positive air movement to improve the working environment particularly during Summer months. In addition, Hi-Line Plus fans can be used during the Winter to recirculate hot air from under ceilings and roofs down to living and working areas thus helping to conserve energy. An infinitely variable speed controller is available for use with one or a combination of models up to 5 units. Alternatively, Hi-Line Plus fans may be wired directly to a normal On/Off switch. For maximum benefit, good ventilation is vital, we advise that Hi-Line Plus fans are used in conjunction with Vent-Axia T-Series or Standard Range ventilation units. Hi-Line Plus blades are produced from sheet steel and individually weighed to produce matched sets. The motor is totally enclosed, capacitor start and run. Suitable for temperatures up to +40°C. Supply Voltage 220-240V/1/50Hz. 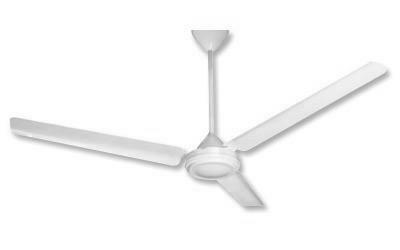 For energy conservation fan selection is dependent upon area and mounting height. Estimate the height at which the fan can be mounted and then calculate the relevant fan size from the table below. Move to meet the diagonal line and then read down to find out how much floor area per fan is suitable. The Hi-Line Plus fans include both a long and short down rod packaged as standard. The total drop length of the short down rod including motor is 360mm. The total drop length of the long down rod including motor is 610mm. The Vent-Axia ceiling fan controller adds extra flexibility to all Hi-Line Plus installations. Fan speeds can be selected to suit varying conditions. This is of particular benefit where mounting height is low. The controller is designed to be used with a single fan or up to 5 Hi-Line fans. The controller is infinitely variable, has solid state components, an insulated spindle, white cover plate and can be flush or surface mounted - please state when ordering. Suitable for commercial environments. Hi-Line Plus fans should be used only with a Vent-Axia ceiling fan controller or an On/Off switch. Supply Voltage 220-240V/1/50Hz. For completely silent running we recommend the use of a 5 step transformer. Suitable for up to 9 ceiling sweep fans. Circulation of air is required in any given area. As a guide, mount Hi-Line fans 4.5 - 6m apart. In tropical climates, 3m apart. Choose the required down rod to ensure that there is at least 2.3m between the bottom of the blades and the floor and not less than 0.75m between the blades and the ceiling or roof. Fans should be mounted so that they do not interfere with lighting installations in any way. Do not mount within 1 sweep diameters of walls or pillars to avoid obstruction of airflow. All that is required is a gentle movement of air to transfer high level hot air down to the working level. There can often be a 10°C temperature difference between roof and floor in commercial areas, with heat escaping through the roof. Hi-Line Plus fans can recirculate this heat, reduce the temperature difference, help save on heating costs and increase comfort and efficiency. Fans should be positioned in the highest part of the roof with at least 0.75m between blades and any part of the roof and at least 1 diameters away from walls and pillars or other obstructions. For normal installations the 610mm down rod length should be used. The shorter (360mm) down rod length should be used where fans are to be mounted to beams below the ceiling or roof. Heat savings are largely dependent on the difference between the roof level and the working level temperatures, the ventilation rate and the geographical position. An approximation of possible heat savings can be made on a ventilation rate of 3 ACH and average U values by using the Heat Savings Calculator. 1. The temperature difference between the roof void and working levels should be measured on a typical Winter day with the installed heating working. The working level temperature should be approximately 18°C (65°F). 2. Determine from the Degree Days Table the appropriate degree days for your geographical location. 3. From the degree day point on the base line of the Savings Calculator travel vertically to the intersection with the differential temperature line. 4. From this intersection, travel horizontally to the left and read off savings. Heating Season September/May inclusive (based on figures supplied by the Department of Energy). Hi-Line Plus ceiling fans can be used in offices, stores, shops, foyers, schools, hospitals, kitchens, restaurants and many industrial applications such as warehouses, factories, tanneries, and workshops. Hi-Line Plus fans will provide effective and positive air movement to improve the working environment particularly during Summer months. In addition, Hi-Line Plus fans can be used during the Winter to recirculate hot air from under ceilings and roofs down to living and working areas thus helping to conserve energy. An infinitely variable speed controller is available for use with one or a combination of models up to 5 units. Alternatively, Hi-Line Plus fans may be wired directly to a normal On/Off switch. For maximum benefit, good ventilation is vital, we advise that Hi-Line Plus fans are used in conjunction with Vent-Axia T-Series or Standard Range ventilation units. Hi-Line Plus blades are produced from sheet steel and individually weighed to produce matched sets.